'Gold leaf paint' may mean a number of things, but it best describes an expensive gilding medium which is also known as 'shell gold' or occasionally 'tablet gold'. This is finely powdered gold mixed with a water-soluble binding medium and dried into a small lump. More details below! Other kinds of gold leaf paint (which don't include real gold) are also discussed further down this page. As you can imagine, shell gold is expensive. But it's extremely useful and convenient. This kind of gold leaf paint has been used extensively over many centuries for book illumination in Western and Eastern cultures. Very fine shell gold can be used to create astonishingly delicate, shimmering detail over the top of paint which has already been applied. Because it's easier to use in small or detailed areas than leaf gold, it can often be found as part of a complex design or a series of thin gold lines. It's not generally used for large areas because it's even more expensive per square centimetre than real leaf gold. Should you wish to make your own gold leaf paint from your extensive supplies (hah!) of skewings, which is the proper name for tiny bits of scrap gold leaf, you may apparently grind your gold leaf finely with honey and salt (which keep the particles of gold separate as they are pounded), using a ceramic pestle and mortar, for at least 30 minutes until the mixture is uniformly beige. Then carefully wash away the additives to leave behind pure fine gold dust. This should be moistened with gum-water and a little glair (beaten and settled egg-white), shaped and allowed to dry before use. Another way of doing it is by mixing up a thick solution of gum arabic in water, adding the gold leaf, and gently grinding it with a forefinger for a half-hour or so until it is very fine. Lazily, and expensively, I tend to buy mine ready-made from goldleafsupplies.co.uk or Cornelissen's in London; but a good reason for trying the above methods for home-made shell gold is to get a finer result. Some of the old Indian Mughal miniatures have astonishingly fine gold work in the margins and I think it is hard to reproduce using modern shell gold. The Gilded Page: The History and Technique of Manuscript Gilding. 'Gold leaf paint' can also refer to any number of gold-coloured or gold-effect paints for use in paper art, or on signs, furniture, and interior or exterior surfaces. These vary considerably in quality, price, and degree of 'goldenness'. Gold-effect paints and inks are often made from fine yellow metallic particles suspended in a medium such as gum, glycerine, acrylic etc. The medium dries and leaves the particles as a gold-coloured layer. 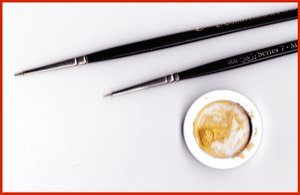 Liquitex acrylic gold is the highest-customer-rated gold-leaf-paint product I can find that's suitable for use on paper and for calligraphic work. (Acrylic paints are plastic-based water-soluble paints; some calligraphers like them very much for use in backgrounds behind calligraphy, or to make up a smooth thick ink. Note that they are no longer soluble after drying. Gold inks can of course be made up at home by diluting real gold-leaf paint (warning: extremely expensive and fiddly) or from cheaper gold-effect paints, or bought ready mixed. Such inks tend to behave rather splodgily with dip-nibs, and can't be used with any other kind of calligraphy pen. They are best suited for large lettering because of their rather coarse texture. Agitate the ink very well for some time before use to get the gold-coloured particles evenly distributed. Sometimes it's easier and actually more efficient to write the text in yellow or light red and then paint the gold onto the letterforms with a very fine brush. For outdoor work, or very large pieces of temporary calligraphy, real gold-leaf paint or artists' paints are not really an option. You might want to look at the various metallic spray-paints or even car-paints that are available. Some rust-retardant paints give a hammered metallic finish which can be very attractive. Many different colours, textures and finishes of 'gold leaf paint' are on offer now, and really it's best to experiment with what's available to find out which suit you best. But reading customer reviews and answered questions online will save you time and money.